Ask any SF&F writer who associates with others of their strangeling kind, and they'll tell you a story about a Worldbuilder: an enthusiatic novice who could talk your ear off for an hour (if you let them) about every minute detail of a universe they’ve half a mind to write about. My favorite anecdote involves a high fantasist eager to talk about his book-in-progress, and to whom I posed the gentle question—ten minutes into an outline for societal castes—of where character arcs might figure in, and plot. “Oh, this is just the first book," he replied. “I’ll get to plot in the second." In Western writing culture, one of the most common prescriptions for strong narrative is “show, don't tell" (or, in science fiction parlance, “only Neal Stephenson gets to go full Neal Stephenson"), but the rule about avoiding didacticism, and exercising care with world-building exposition, exists in part because it means something to break this rule; because a different sort of story can arise when the rule is broken; and because few are deft enough to pull that story off. 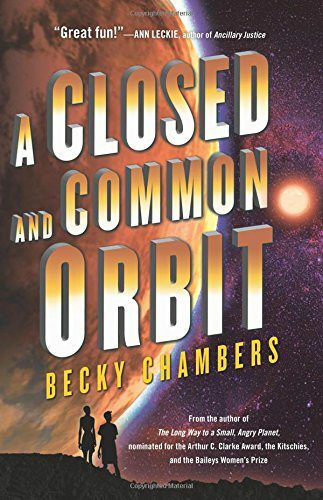 When Becky Chambers published A Long Way to a Small, Angry Planet in 2014, she broke the rule well: she aligned readers with the vantage point of an outsider to introduce a range of alien and human cultures coexisting on a scrappy interstellar spaceship, and she used verbal interactions between this outsider and her coworkers (interspersed with database entries from related network queries) to advance a wealth of speculative cultural anthropology, food science, linguistics, and related techno-environmental geekery. In consequence, the book’s Arthur C. Clarke Award nomination was especially fitting, for in that long vein of science fiction that negotiates why we are what we are and what else we might become, Chambers produced a story that served as much as philosophical discourse as riveting space adventure. The challenge for any sequel, of course, is to construct a new tale that amplifies the essence of the original work, while still innovating within its core universe. For Chambers, whose first book relied so much on the seamless integration of extensive cross-cultural discussion, this challenge deepened: could a second book in the series also use the outsider perspective to justify thoughtful, in-depth conversations between obliging sentients, and would doing so achieve the same effect for those already familiar with the universe of the first? In rising to this challenge, Chambers’s A Closed and Common Orbit (2016) introduces not one but two characters new to their circumstances: Sidra, the chosen name of an AI downloaded into a human “kit” at the close of the first novel, and Jane, a clone whose world-limits literally explode at the age of ten, but who survives the difficult aftermath to become Pepper—in the first novel, a professional tinkerer and tech trader; in this story, a friend who helps Sidra adjust to personhood. Pepper’s tragic backstory occupies a paragraph in Chambers’s first book, but that paragraph omits a vital detail on which the second novel hinges—namely, the existence of an AI who helped Jane grow into her own personhood before Pepper came to be. The structural benefit of these two stories, interwoven here in alternating chapters, is twofold. First, Chambers creates the narrative capacity to pose and answer a range of delightful world-building questions, such as: how does one tattoo a scaled or feathered sentient being? What kinds of social roles might exist within a four-sexed species? And what potential issues could arise when trying to modify an AI’s core behavioral programming? Moreover, these conversations, while certainly demonstrating considerable authorial attention to detail, do not simply take place for show: the tattoo conversation. For instance, reveals to Sidra a possible solution to a more existential hardware problem, and learning about the four-sexed species native to her new home proves integral to both her cultural acclimation, and the development of her first new friendship on more equal terms. Likewise, issues involving AI modification establish an ongoing state of peril for Sidra and her friends, offer a set of secondary tensions regarding how well her personhood is received by others, and provide cover for a crucial component of Pepper’s own story arc. Because little Jane first lived in a world where questions beyond the scope of one’s immediate work were punished, there is also a strong sense in this novel that the ability to acquire knowledge of one’s choosing is both a tremendous privilege and a responsibility not to be taken lightly; every social question matters when the ultimate quest is to decide where one fits in. Secondly, and perhaps more critically to the challenge of writing a sequel, Chambers’s outsider viewpoints transcend simple plot device by providing a thematic touchstone for both novels. Sidra and Jane, after all, are not the only sentient beings who have to begin again: Tak, a gender-shifting Aeluon, reveals an initial desire to become a historian before finding more purpose as a tattoo artist, and must undergo another major shift in perspective after discovering Sidra’s origins. Then there’s Blue, Pepper’s partner and fellow escapee from an oppressive culture, who has built a life of new purpose as an artist, after already being displaced once from the calling for which he was first genetically engineered. And even Owl, the AI who helps little Jane survive to become Pepper, has gone through multiple purposes—and continues to adapt, over the course of this novel, as each character strives to make a place for themselves in themselves, as well as in the surrounding world. Tendrils of this thematic throughline were already present in The Long Way to a Small, Angry Planet; Rosemary, for instance, took a job on the Wayfarer to rebuild her life in the wake of circumstances beyond her control, while her better-travelled associates, like Sissix, a member of a highly intimate species, and Ohan, a member of a proudly symbiotic species, also had to adjust to extreme shifts in life outcome. Likewise, even Sidra’s existence in the second novel was made possible only by the devastating loss of a beloved character in the first, and the consequences of this fact offer the only significant narrative tether between both books. As the title of Chambers’s second book suggests, the scope of A Closed and Common Orbit is geopolitically smaller than the first; there is no threat of interstellar war looming on the horizon, and no character single-handedly transforms a broken civilization (as much as Pepper and Blue might wish they could, to save the rest of the clones and misfits on their planet of origin). But as the above excerpt suggests, it would be a mistake to conflate the “smallness” of this book’s galactic stakes with the impact of its character revelations. After all, upheaval might be inevitable in Chambers’s fictions, but personal growth is not—and if Sidra’s and Jane’s journeys toward full personhood are any indication, the requirements for inner growth are probably not any easier for one kind of sentience over another. Alien, human clone, advanced software in a fancy skin—for any of us, life as we think we know it can change at any time. A Closed and Common Orbit simply reminds us that, in a universe of immense and wondrous possibilities, there's no shame in finding oneself a novice here anew.